MARQUETTE — A majority of the crew aboard Dr. Matthew Songer’s racing sailboat fell ill last weekend in the middle of Lake Michigan. But that was a lot better than what happened to a crew member who lost his life in the 110th running of the Chicago-to-Mackinac Island race held last weekend. Rough water due to headwinds steadily around 22 to 23 knots rocked the Marquette doctor’s 40-foot-long single-mast J122 sailboat named the Evvai — an Italian exclamation — with seven- and eight-foot waves for about the first 40 hours of the race. 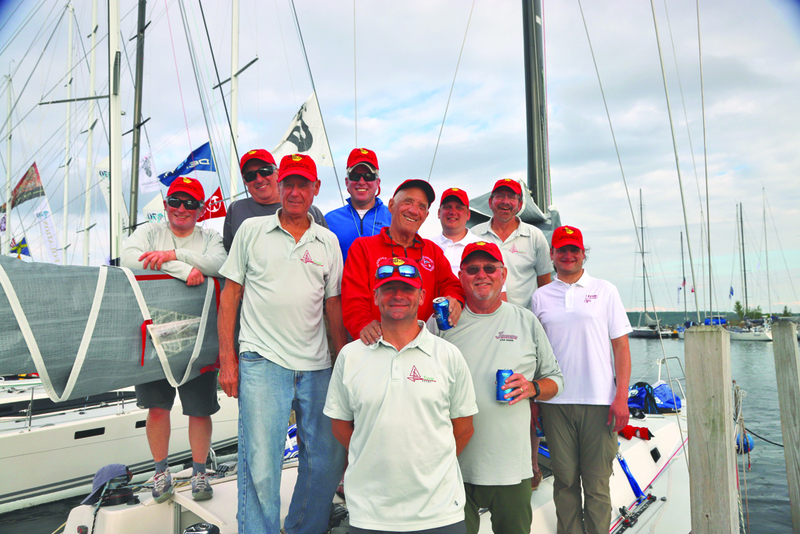 “We were first overall and first in our class after one day, but then lots of the guys got sick,” said Songer, who is owner and skipper of the Evvai. He said seven of his 10 crew were not able to participate at that point. Normally, five members of the crew at any one time are working to keep the boat on course, with the other five on break. The death occurred Saturday afternoon on a boat named the Imedi when experienced sailor and triathlete Jon Santarelli, 53, of Chicago fell overboard and his flotation device didn’t automatically inflate as it was supposed to, according to a report from The Associated Press. Santarelli was reportedly leaning toward the back of his boat to make a routine sail adjustment when the boat was hit by a large wave, Chicago Yacht Club Rear Commodore Nick Berberian said in the AP report. A seven-hour search involving the U.S. Coast Guard, 20 boats and three helicopters covered 47 square miles before it was suspended without finding Santarelli’s body late Saturday. His body still had not been found by the end of Wednesday, according to a report from the Chicago Daily Herald. Songer has been in this race, officially called the Chicago Yacht Club Race to Mackinac, for 20 years now. “This was the toughest conditions I’ve ever sailed in because it (the wind) was continuous for so long,” Songer said, adding that intermittent rain squalls didn’t help conditions either along the 290-mile course. “Then for the last 12 hours as we approached Mackinac Island, the wind dropped off to nothing. It took us hours to make the last quarter-mile. As it was, his boat’s time of 2 days, 4 hours, 1 minute and 24 seconds was third in his section of the Racing Division. The Evvai set sail about 2 p.m. EDT Saturday from Chicago’s Navy Pier and pulled into port at Mackinac Island around 6 p.m. Monday. He estimated there were about 16 boats in his section, part of a contingent of 300 overall that included 2,600 sailors from 39 states and 16 countries. “I think we are the only boat from Marquette, in fact I don’t know of another boat (entered) from Lake Superior,” Songer said, adding that in years when the biennial Trans Superior International Yacht Race is held there are usually more boats from this region entered in the Chicago to Mackinac. The next Trans Superior, which runs from Whitefish Bay near Paradise to Duluth, Minnesota, is set for early August 2019.